We are told in the Gospel of John that on that first Easter day Peter and another disciple visited the empty tomb and returned home, “for as yet they did not understand” (John 20:9). Mary Magdalene sticks around the garden by the tomb and encounters the risen Christ. She goes to the disciples and witnesses: “I have seen the Lord” (John 20:18). That evening, we find the disciples hiding, frozen with fear. They have locked themselves in and locked the world out. Jesus appears in the midst of them, offers a blessing of peace, shows them his wounds, reveals their new “sent” mission and equips them with the Holy Spirit (vv. 19-23). Thomas missed all this; he was not there. Why wasn’t he hiding with the rest of the disciples? The other disciples witness to Thomas in the same way Mary witnessed to them, saying “We have seen the Lord” (v. 25). And, just like the other disciples, Thomas found that hard to believe. And so, a week later, Jesus makes a special trip just for Thomas. Jesus finds them all in the same house. Were the doors still locked? Were the disciples still afraid? “Peace be with you,” Jesus says again. 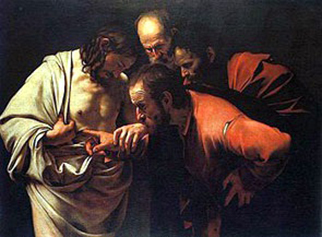 He invites Thomas to touch his wounded body and believe. Mary, Peter, Thomas and the other inner-circle disciples share an Easter epiphany. They believe when they encounter the risen Christ. Many generations and countless witnesses later, we can feel a little smug when we hear Jesus say “Blessed are those who have not seen and yet have come to believe” (John 20:29). We can also feel ashamed: We remember our fear and doubt. We realize that we lock ourselves in and lock others out. We confess that we miss seeing Jesus in our wounded neighbors. We admit that we find the witness of others a little hard to believe. The good news is Jesus comes to us and stands in the middle of our fear and doubt. In the Holy Meal we are invited to touch the embodied Christ. In the waters of baptism the risen Christ gifts us with peace and equips us with the Holy Spirit. In Christian community we are blessed to see the Lord and believe. Alleluia. Originally posted April 7, 2012, at A Hyphenated Life. Republished with permission of the author. Find a link to Sue Edison-Swift’s blog A Hyphenated Life at Lutheran Blogs.